Earlier today, the House Rules Committee held a hearing on whether farm animals are getting too many antibiotics for their own good. 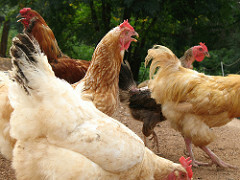 Ever since 1951, the year the FDA approved the addition of penicillin and tetracycline to chicken feed, it's been common for livestock animals to get pumped full of antibiotics to ward off disease and promote growth. The practice may have had a certain logic in the early years. But it's rapidly becoming clear that there are major downsides, too. A growing number of medical and epidemiological studies have shown that the use of antibiotics in animal feed has helped give rise to a new breed of drug-resistant bacteria across the country. The most famous example is MRSA—methicillin-resistant Staphylococcus aureus, also known as "flesh-eating" bacteria, which may well be incubating in hog farms and has spread rapidly in the last five years. New strains of antibiotic-resistant salmonella and campylobacter are also on the uptick. The key question, though, is: How much money have antibiotics actually saved consumers? In the U.S. poultry industry, the efficiency gains over the last 50 years have been impressive—average animal weight is up 50 percent while the amount of feed required is down by 35 percent—but it's unclear what role drugs have played. And, in fact, when Denmark banned non-therapeutic uses of livestock antibiotics, a study found only minor decreases in the "feed-conversion ratio." Likewise, Jay Graham of the Johns Hopkins School of Public Health conducted a randomized trial at Perdue and found that getting rid of antibiotics actually lowered costs slightly. These studies may not account for all potential costs of a ban (an increase in veterinary fees, for instance), but they are suggestive. But even if a ban would impose costs on the industry and make meat more expensive, it could still be worth the price. Independent estimates by the Board on Agriculture and Natural Resources have concluded that phasing out non-therapeutic drug use for livestock would cost consumers $1.2 billion to $2.5 billion per year. That's a lot, but it's still less than the $4 billion to $5 billion that antibiotic-resistant bacteria cost the U.S. health care system, according to one study.